This is a landrace dry bean collected in Ijevan, Armenia. I obtained my seed from Joseph Simcox in 2016. It is what I would call a “short” pole bean, reaching 5 – 6 foot in height. The plants were very healthy and matured in 80 days. The beans are quite large with moderate productivity. These have not yet been adapted to my climate and I would assume yield will increase overtime with selection. 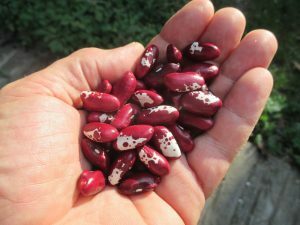 The maroon beans produce about 1/2 with white markings. I have no other information about this rare bean but will update this webpage if I can find more details.